Jeff Horton was born the youngest son of a career Air Force master sergeant. A voracious reader growing up, he read the Bible, and stories by many popular authors including Sir Arthur Conan Doyle, H.G. Wells, Jules Verne, Edgar Rice Burroughs, Michael Crichton, Tom Clancy, C.S. Lewis, and J.R.R. Tolkien. 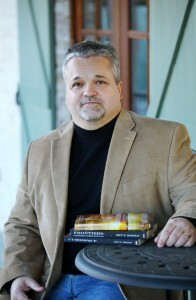 Jeff Horton is an author and screenwriter of family-friendly fiction, writing within several different genres, including science-fiction, fantasy, and apocalyptic thrillers. When he’s not penning his next novel, he enjoys reading, going to church, and spending time with his family. Jeff Horton is a member of the North Carolina Writers Network. Although I’ve had an interest and desire to write for a very long time, what finally gave me the motivation I needed to start was a perceived lack of new family-friendly literature and films coming out, books and films that parents could feel comfortable with their children reading or watching without having first seen them first themselves. With so much overt sensuality, violence, supernatural horror, and gore, I’d often be left shaking my head, wondering what became of the great writers of the past. Note: I’ve since learned that as far as films go, Hollywood has largely chosen to ignore a great many excellent works of literature in favor of third-rate, warmed up leftovers from 60s, 70s, and 80s. My writing style is actually a mix of organic and structured writing. I find that a blend or hybrid of the two works best for me. I start with some loose definition of a plot, a storyline, a setting, and at least the main characters. I try to at least gat an idea of where of where I’m heading and once I do, I start writing organically. The organic style allows my creativity to flow unabated, taking new and unexpected twists and turns, breathing a life into the characters that otherwise would have been strangled. The more the story takes shape, the more defined the outline becomes. I’m not sure what exactly you mean by “interacting” with the characters. I suppose I might occasionally say something like, “now what would do next if this happened to you” or “now what would make you mad enough to cause you to do this? Well, as in all of life there’s good news and there’s bad news. First the bad news; might as well hear it first from me, just because you decide to sit down and write what very well might be the best book written in a hundred years, it doesn’t mean that all of your dreams of suddenly becoming the next J.R.R. Tolkien, C.S. Lewis, or Tom Clancy, with all of your books becoming bestsellers, and box office sensations, will come true, at least overnight. The truth is there are a lot of folks writing these days and the competition to get noticed by agents, publishers, and the public is fierce. In terms of film, there are plenty of folks in Hollywood these days who would prefer playing it safe by reclycling known, second-rate material, rather than taking a risk on untested material. Now, the good news; if you really enjoy writing, there are more ways today than ever before to get your work published. For example, there is self-publishing, vanity and/or subsidy publishing, traditional publishing, the list goes on. It’s good that these alternative methods of publishing are becoming more and more accepted in literary communities, but if your book does well in the marketplace, isn’t that what really matters? After all, if you self-publish but sell a LOT of copies, don’t you think your book will get noticed? My advice? Write because you enjoy it; write because it’s who you are. I came a cross an open call for submissions by World Castle Publishing when the company was just getting started several years ago. In weighing the decision to go with a traditional publisher over self-publishing, I decided that going with a traditional publisher would leave more doors open to me in the future. One of the things I really like about World Castle is that if one of my books ever gets picked up for a film, I retain all film rights. Oh, I think books are here to stay, although the specific formats may well change as time progresses. I also tend to buck the trend about traditional publishing; I believe it’s here to stay. I mean, people can brew their own coffee but it hasn’t prevented Starbucks from taking off as a worldwide, successful company. Much the same could be said for a number of industries. Designing covers, editing a novel, setting up distribution channels, marketing, making business connections, this is all the work of traditional publishers; how many authors really want to be doing all of that AND write too?